Marking Essays provides advice, guidance notes, and support materials for tutors who mark and grade essays. It is suitable for use in schools, colleges, and universities. All the common problems of assessment, grading, and offering written comments are clearly explained. 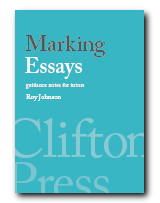 Marking Essays features practical advice from experienced tutors, grading schemes, and suggestions for using IT solutions. It deals with all the most important questions of assessing and responding to academic writing. Read this .mobi format eBook on a Kindle — or on your PC, using the free eBook reader from Amazon.